See http://www.shsu.edu/~chm_tgc/primers/pdf/GC.pdf for a PDF version of this document. The inside diameter and chromatographic film amount (the thickness of the chromatographic surface in the column) of modern capillary gas chromatographic (GC) columns dictates that the amount of injected samples (the mass of analytes inject on-column) is relatively small compared to packed columns. For instance, packed columns can handle tenths of milligrams (100s of micrograms) injected. For example, analyte peaks A and B can be successfully separated with masses of 200 µg A and 125 µg B and still get baseline separation (the chromatographer's holy grail). With packed columns this is all good. But capillary columns are much more easily overloaded: A and B need to be 20 µg and 12.5 µg at a maximum to be baseline separated if they're closely eluting (similar retention times). At masses much above this the chromatographic peaks are overloaded (see here) and overlap because all the chromatographic active sites in the capillary column's chromatographic surface are filled and additional analyte is not retained, vastly broadening the peaks. And for very small diameter capillaries (say, microbore, 0.1 to 0.05 mm diameter columns) the overload level occurs at even smaller masses 1 µg amounts). Using merely a flick of a software-controlled valve the amount of injected analyte can be instantly varied before an injection is made. This is called the split ratio and is a function of the ratio of gas flows through the GC's injector, all controlled by pressure/gas flows in the injector. Wait, wait it'll get better. In older instruments this was carried out by manual control of gas valves. But in modern GCs this is all controlled by software and can be stored in the digitally saved analytical method. The normal GC injector configuration is below. In this example, a total flow of 49 mL/min comes into the injector from the pressurized carrier gas tank (He is most common; N2 is cheapest but chromatographically less forgiving). 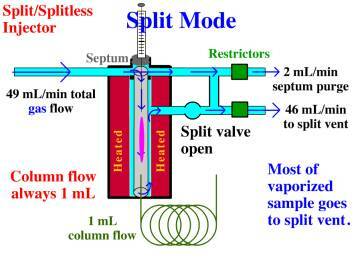 Note that the total gas flow flows 1) through the column (green thing at bottom), 2) out the septum purge, and 3) out the split vent and those flows always add up to the incoming flow (49 mL/min in this example). So 1 + 2 + 46 = 49 mL/min. And as the above image shows the gas flow passes through the septum purge and the split vent. This configuration is called the split mode because some of the gas in the injector exits though the split vent. This means--and this is paramount--that some of the sample injected into the injector by the sample syringe will get vaporized and escape through the split vent. See below; the pink in the injector is meant to be vaporized sample. In this example, the split ratio is 1/49 because 49 parts are injected and 1 part goes on column. Again, this is a split injection. 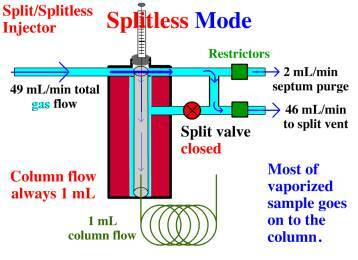 If the concentration of an analyte is high, say, 25 µg analyte/ µL (pretty high for capillary columns) and 1 µL is injected, the analyst--that's you--chooses the split injection mode and opens the split valve before the 1 µL injection is made. (With autosamplers and multiple samples this would be programmed into the method.) This means that the mass of sample actually injected (remember that the sample contains 25 µg analyte/µL) would be 1/49th of that, that is, 25/49 µg analyte/µL and this is about 0.5 µg analyte/µL (actually 0.5102 µg injected but that's to accurate to worry about given the slop in a 1 µL syringe). Again a 1 µL injection--with a concentration of 25 µg analyte/µL and a 1/49 split--is made but only 25/49 of the mass injected goes into the column (on column) so it's as if a 25/49 dilution has been made but the time required is only the software flip of the switch! Now that's efficiency; a dynamic dilution has been made without actually adding solvent and actually making a dilution. But what about trace analysis, that is, when the sample contains very small amounts of analyte, an analyte mass close to the detection limit of the method? If a split injection is used then there won't be enough analyte injected on-column to detect. Bad news. So for trace analysis, splitless injection is used. Again, this is merely a flip of the switch. See below. In this process--done with the same instrument--all the analyte sample vaporized in the injector goes onto the column. This is called the splitless mode and it's used for trace analysis because all the analyte mass in a 1 µL injection goes on column, and is not split; and so this is the most sensitive that the method can be: a splitless injection. Finally, you might ask what's going on with the septum purge: note that in this example is it 2 mL/min in whatever mode the analyst uses (splitless or split). The constant septum sends clean carrier gas past the bottom on the septum and out to waste. This helps to 1) keep the septum clean and 2) keep sample adsorbed on the septum from getting into the gas in the injector and creating ghost peaks; that is, analyte peaks that are carried-over from one injection where their concentration is very high to another where they're not supposed to be at all. For modern capillary GC the decision to inject split or splitless is made before each injection. If I talk to an analyst that doesn't know which mode is being used, I know we've got problems.